More than 1,000 doctors have declared their support for a repeal of the Eighth Amendment by signing a declaration which was revealed at the National Doctors Together for Yes in Dublin this morning. Doctors from every county in Ireland have added their names to the document including GPs, psychiatrists, obstetricians and medical students. The event was attended by Minister for Health Simon Harris. 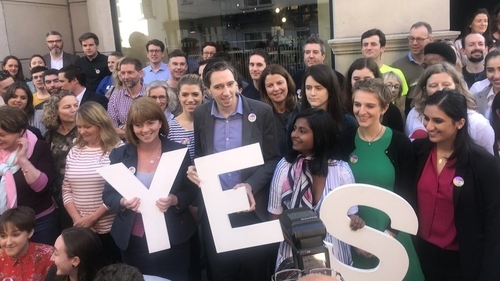 At the launch of Doctors for Yes Summit, Mr Harris also said he hoped that the next number of days in the Eighth Amendment referendum campaign are respectful and based on fact and truth. Mr Harris said with 13 days left until polling on 25 May, undecided voters should take their time to familiarise themselves with the facts and not be led by misinformation. Speaking at the event, Professor Mary Higgins, Obstetrician at the National Maternity Hospital said that she was supporting a ‘Yes’ vote because of the women and couples she has not been able to look after in the past. She said that people who came to her in the past would have felt like she abandoned them but that a ‘Yes’ vote might allow her "redemption" to say she would be able to look after others in the future. Dr Henry said when she campaigned in the 1983 referendum that very few doctors got involved in urging people not to put the Eighth Amendment into the constitution and that it had resulted in "many unintended consequences"
Trainee GP, Dr Anna Murphy told the event that she supported a repeal of the Amendment because in 2018 people were still speaking about women's health "in hushed tones"
She said she did not want women to be afraid to come to her.